Ashampoo’s slogan is “We Make Software!”—and they mean it. The German software company is best known for its wealth of PC tune-up tools, which include a Windows optimizer, a registry cleaner, and an Internet accelerator. Now, Ashampoo also makes a security suite—sort of. Ashampoo Anti-Virus 2014, which costs $40 for one year of protection on one PC, is the company’s first foray into the antimalware market. I’m all for newcomers, and I can vouch for the fact that a big name doesn’t necessarily mean better protection or more robust features, but Ashampoo’s suite is not exactly what it appears to be. 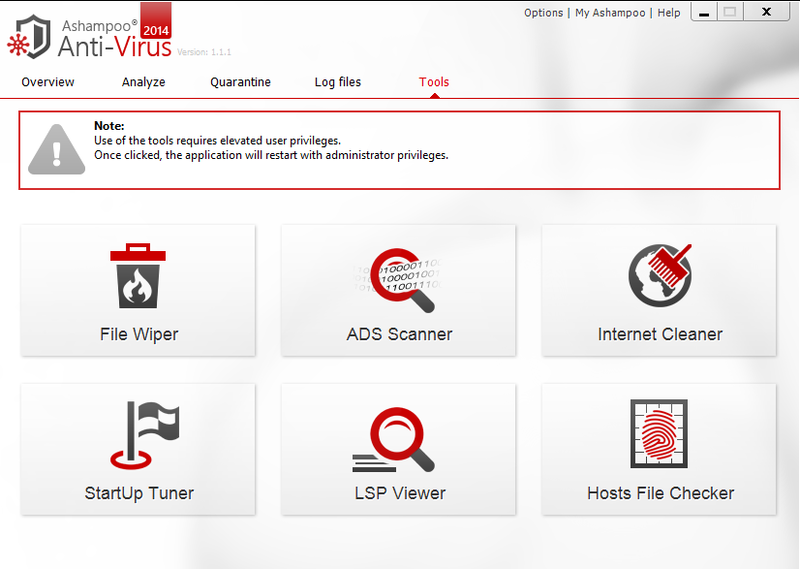 According to the company’s website, Anti-Virus 2014 “combines two powerful scan engines to achieve the best protection.” What this actually means is that Ashampoo didn’t, in this instance, make its own software—instead, it licensed antivirus engines from fellow security providers Bitdefender and Emsisoft. Ashampoo Anti-Virus 2014 has an attractive, touch-friendly interface. Protection-wise, this isn’t an issue. We had our partner, AV-Test, run Ashampoo through its tests, and the security suite performed admirably. In the real-world protection test, Ashampoo completely blocked 100 percent of malware attacks. In the malware zoo detection test, the suite detected 99.83 percent of prevalent malware (discovered in the last four weeks), which is quite good—Ashampoo failed to detect one Win32 bot (out of 922) and it also missed a handful of Trojan Horses. The suite manages to do this without putting too much strain on your system: In AV-Test’s performance tests, Ashampoo scored 10 (out of a 5 – 25 scale, with 5 indicating minimal performance degradation). 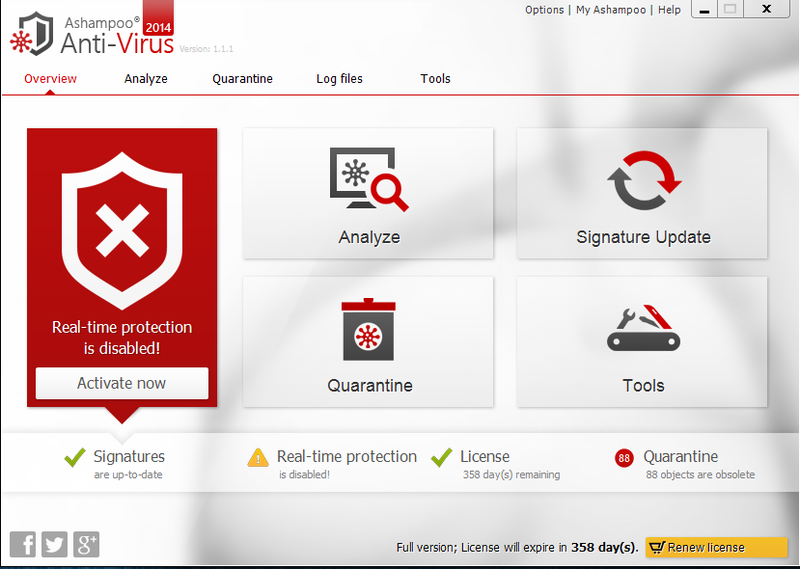 While it’s not the lightest antivirus program on the market, you shouldn’t see too much of an overall impact. The suite added a mere .11 seconds to startup time, and had virtually no impact on file download time. AV-Test’s results did show an increase in website load time (around 13 seconds, on average), as well as application install time (15 seconds on average) and file copy time (118 seconds on average). Tread carefully in the advanced settings if you're not an anti-virus power user. But a security suite is more than just its licensed antivirus engines. Ashampoo bills its suite as software you can “install and forget,” because the suite supposedly works swiftly and silently in the background to keep your system protected, speedy, and up-to-date. I didn’t find this to be the case, however. Ashampoo’s greatest asset is its interface, which is polished, attractive, and touch-friendly. The main screen features a large panel that displays your protection status and four large buttons for quickly analyzing your system, updating your signatures, and accessing quarantined files and additional tools. It doesn’t have a quick-scan button from the main screen, but if you hit the “Analyze” button you’ll see an array of scanning options (full system scan, quick scan, external drive scan, and custom scan). Utility tools are Ashampoo's specialty. Additional tools are Ashampoo’s forte—in this suite you get a secure file wiper, an ADS scanner, an Internet clean-up tool, a start-up tuner, an LSP viewer, and a Hosts file checker. Strangely, because use of tools requires “elevated user privileges,” clicking on any tool restarts the application with administrator privileges. I’m not sure why those privileges aren’t turned on by default (and once the program is restarted, it will restart for each additional tool you click on). Back to the “install and forget” promise: I found Ashampoo to be anything but. After the initial installation, I started up my PC only to see a small, red X in my system tray. I clicked on the X—Ashampoo’s system icon—and up popped an ad for Ashampoo. It wasn’t until I clicked to close the ad that Ashampoo actually started up and started actively working to protect my system. Another issue I found during my test-run of the product was the full system scans: Only about 30 percent of them successfully completed. I found myself constantly having to restart the scans after they stopped—not exactly a product I could “forget” about. On top of this, I also found that Ashampoo had problems removing quarantined files and updating its signatures on its own. In fact, I’ve updated the signatures manually at least three times. Ashampoo told me this is a problem they’re working on. Ashampoo Anti-Virus 2014 offers decent protection, but so do a host of other security products. These days an antivirus product’s value often comes down to its interface, and Ashampoo's has quite a few problems, including a lack of user-friendly options in the settings menu, and the need for constant manual maintenance. Until the program can live up to its “install and forget” promise, you’d be better off looking elsewhere for you PC protection. Ashampoo's antivirus offers excellent protection, but the amount of user interaction required is probably more than most are willing to invest.